Holy cow! There’s only a week until the Riverside Airshow and I’m just now adding it to my website! I’ve never been to the Riverside Airshow which is why this blog entry doesn’t have one of my photos at the top. I’ve planned to go for at least the last 8 years, but it always seems to sneak past me. This year will be different, though, and I’ll be there if it’s not rained out. FWIW, I’ll be watching THIS 7-DAY FORECAST for weather information, but as I type this the forecast is mostly sunny and a high near 75°F. Just right! Although I haven’t been to a Riverside Airshow I’m familiar with all the aerobatic performers, and it’s an excellent lineup which includes Doug Jardine in his Sbach 342 Thunderbolt, Jon Melby in his Pitts S-1-11B Muscle Bi-Plane, Rex & Melissa Pemberton (Rex in a wingsuit and Melissa in her Edge 540), John Collver and his T-6 Texan, and Dr. Frank Donnelly (Dr. D) in his 1946 Taylorcraft. There will also be fly-bys by various aircraft formations and a race between John Collver in his T-6 and Bill Braack and his Smoke-n-Thunder Jet Car. There will also be lots of aircraft on static display and a car show which will include custom cars and military vehicles. The air show is free, but parking is $10 per vehicle. 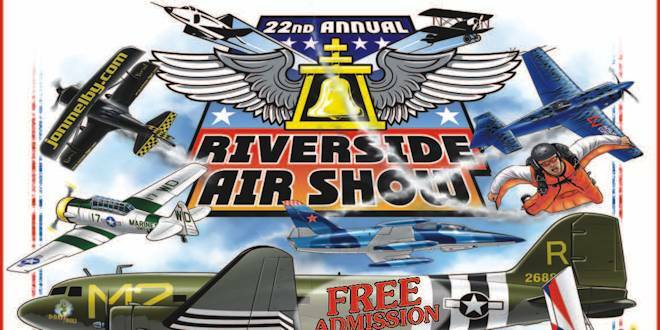 For more information you can CLICK HERE to visit the official Riverside Airshow website.